Railpictures.ca - Doug Page Photo: The road next to the cold storage in Aldershot used to be a fine place to get train pictures. You could get unobstructed shots without getting too close, and it was good for shots of trains working the yard as well as eastbounds and westbounds much of the day. Unfortunately, it is now fenced off… But on this spring day back in 1994, I was fortunate enough to get this CN westbound (likely headed for Buffalo, with a Port Robinson set off) with some borrowed CN family power. At the time, former DT&I GP38ACs were common, while CN units were starting to operate in the U.S. on Central Vermont and Grand Trunk Western trains. Power is CN SD40-2W 5355, GTW GP38ACs 6206 and 6213, and CN SD40 5035. | Railpictures.ca – Canadian Railway Photography – photographie ferroviaire Canadienne. Caption: The road next to the cold storage in Aldershot used to be a fine place to get train pictures. You could get unobstructed shots without getting too close, and it was good for shots of trains working the yard as well as eastbounds and westbounds much of the day. Unfortunately, it is now fenced off... But on this spring day back in 1994, I was fortunate enough to get this CN westbound (likely headed for Buffalo, with a Port Robinson set off) with some borrowed CN family power. 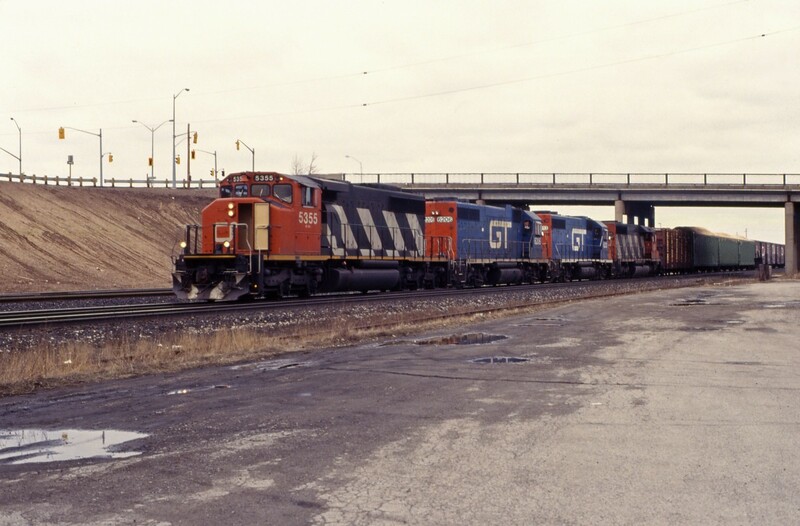 At the time, former DT&I GP38ACs were common, while CN units were starting to operate in the U.S. on Central Vermont and Grand Trunk Western trains. Power is CN SD40-2W 5355, GTW GP38ACs 6206 and 6213, and CN SD40 5035. I didn’t really discover this vantage point or the others nearby until it was almost too late – such as Howard Road. But I did get a few shots, but by the time I really wanted to use ‘em it was all fenced off – once the triple track was installed in ’06 ’07.